I was out for a walk with my camera the other day and came across a puzzling scene. 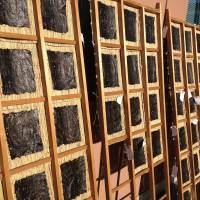 I saw people putting what I thought were squares of dark paper onto easels in the sun, as if to dry. But when I went closer, the squares actually seemed to be nori seaweed sheets, the type used to make sushi rolls. Can you find out what the heck I saw? I eat sushi all the time but I realize I have no idea how nori is made. It would be great if you could explain that too. By plugging the date and coordinates of your walk into my secret decoder ring, I was able to deduce that you stumbled onto a noritsuke taiken, a make-your-own nori workshop at the Omori Nori Museum. This relatively new educational facility, which opened in Tokyo’s Ota Ward in 2008, runs nori-making workshops on some weekends from January to April. The purpose is to share a fascinating piece of local history, which is that for about 200 years, until the early 1960s, Omori was a thriving center of nori cultivation and manufacture. In Japan, people have gathered the wild plant off rocks for thousands of years, using it for both food and fertilizer. When Edo (present-day Tokyo) was settled, it was discovered that the tasty sea plant grew in abundance in the nearby bay and up the mouths of rivers that connected to it. In Edo, this seaweed was called “Asakusa” nori, for the place along the Sumida River where it was often collected. Edo fisherman noticed that nori reproduced well around the stakes they drove into the shallows to hold their nets, and by the early 18th century a primitive method of cultivating the seaweed had been devised. Cultivators drove the ends of bamboo sticks into the seabeds at the mouths of rivers near the bay, creating production beds with tidy rows of upright stakes on which the algae could attach and reproduce. 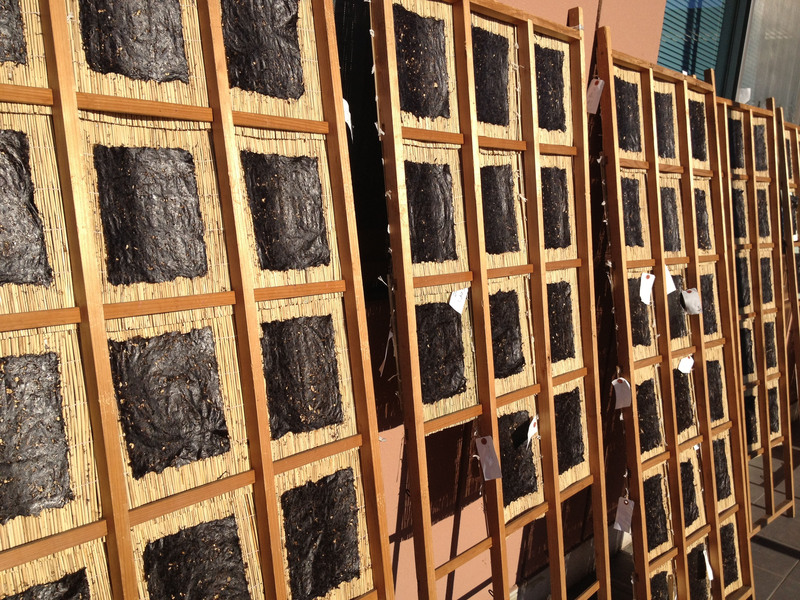 To harvest, growers would row out to the beds and laboriously pull the nori off the stakes and into their boats. After a while, it was discovered that the spores did their best reproducing in salty waters, yet bloomed better in water with lower salinity. So villages around the bay began to cooperate to seed stakes in places with salty water and then transplant them to mixed-water shallows near river mouths. Nori had always been eaten wet in Japan, but as cultivation methods improved growers wanted a way to preserve their production. Some clever person, whose identity has unfortunately been lost to history, drew on techniques used in traditional paper-making to come up with nori as we know it today — paper-thin dried sheets that keep well and are perfect for wrapping around rice. From 1894 to 1939, Tokyo was the number-one nori-producing area in Japan, ahead of competitors such as Chiba, Aichi and Hiroshima prefectures. But Tokyo’s industry gradually fell victim to land-reclamation, dredging and pollution. In 1962, the national government offered compensation to fishing cooperatives and nori cultivators to give up their rights in the bay, opening the way for further port development. Today, nori is still cultivated on the far side of Tokyo Bay in Chiba Prefecture, but the most important production areas in Japan are in Kyushu, around the Ariake Sea; in Mie and Aichi prefectures around Ise Bay, and in the Seto Inland Sea. By this point in my research I wanted to see for myself how nori is made, so I signed up for a workshop. Volunteers who had grown up in nori-making households were on hand to take us through the traditional process, showing us how nori was chopped, by hand or using a meat grinder, then mixed with water to make a kind of slurry. Then we got to step up and make sheets for ourselves, which is done by pouring a measure of the slurry into a mold held over a woven, slatted mat. The water drains away, the mold is removed, and what’s left on the mat is a thin layer of chopped seaweed. We then hung our mats on easels in the sun to dry, which is the point in the process at which you must have wandered by. Another interesting fact I picked up is that virtually all nori cultivators in Japan now grow the same variety, a hardy transplant from Hokkaido called susabinori (Porphyra yezoensis). Even so, the taste, color and texture of the finished sheets varies widely, depending not on differences in production but rather on the temperature and salinity of the seawater in which it is grown. The sheets of nori you get in stores have been crisped over heat to bring out the flavor, and are called yakinori (“yaki” in this case means “toasted”). You can also buy ajitsukenori (flavored nori), which is spiced up with soy sauce, sugar and other seasonings, although I personally prefer the plain. And while I will say that it was interesting to eat nori I made myself, in the future I’m leaving it to the pros. In fact, I’m all fired up to sample products from various regions and explore the differences. On March 10 and 17, the Omori Nori Museum at 2-2 Heiwajima, Ota-ku, Tokyo, will hold nori-making workshops. They are free and are conducted in Japanese. Sign up by calling (03) 5471-0333. The last two workshops of the year will be held in April, but the dates have not yet been released. Visit norinoyakata.web.fc2.com for details. For more on this topic, including photos of nori-making and tips on finding nori-making opportunities outside of Tokyo, please visit my blog at alicegordenker.wordpress.com. Puzzled by something you’ve seen? Tell me about it: whattheheckjt@yahoo.co.jp or Alice Gordenker, A&E Dept., The Japan Times, 4-5-4, Shibaura 4-chome, Minato-ku, Tokyo 108-8071.